HOUSTON, TX — StormFender, an innovative, versatile, and proprietary fender solution, will take the worry out of the most anxious parts of boating, including returning to the dock and leaving your boat untended in stormy weather. StormFender™ Boat & Dock Fenders attach to the dock, eliminating the hassle and unreliable performance of traditional air-filled hanging fenders and providing superior protection for all shapes and sizes of watercraft. After five years of development and product testing at marinas and on private docks from Texas to Maine, StormFender will make a boatshow appearance at the 2015 Miami International Boat Show in Miami, FL., February 13 to 16. Two and a half years ago, the Newport Yachting Center, in Rhode Island’s historic Newport Harbor, installed StormFender on its very busy fuel dock. It was in 2008, while viewing the aftermath of Hurricane Ike, which did nearly $30 billion in damage to the southeastern United States, that Jonathan Hough started developing StormFender. The StormFender™ Boat & Dock Fender stands apart for its superior hull protection, ease of installation, and stylish design. 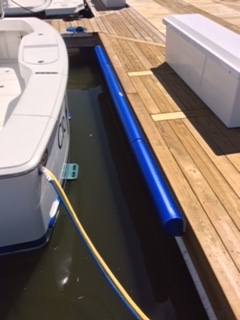 Unlike most other dock bumpers, the StormFender system combines a closed-cell foam core with a soft yet durable PVC-coated fabric cover. It has high impact resistance, but won’t mar or scratch a yacht’s finish. The StormFender system can be installed in minutes. The simple, yet ingenious, fender mounting system requires only a cordless drill and level to attach the track to the dock and the fender assembly is fast and intuitive. With the mounting track installed permanently, the fenders can be used seasonally or year round. The fenders will not deflate; come untied or move out of position, and do not require maintenance. StormFender™ products are available in a variety of colors, standard lengths of 40”, 80” and 120” and can be configured to meet nearly all dock configurations. Custom lengths as well as interior and exterior corners are also available. Recreational boaters and marine industry professionals are encouraged to stop by booth 3989 in the Retail Pavilion at the Miami International Boat Show in Miami, FL, between February 13 to 16 to see first-hand the latest in boat fendering. For more information on Stormfender™ Boat & Dock Fenders, click here.